Last week, I wrote about how we couldn’t put up Christmas decorations until after my birthday. I made mention of liking to drive around to see the decorations. So, I figured I would expound upon that thread and give you another Reminiscing article. Besides, it’s Christmas time, so it’s the best time to write about it. Although, next week, I may write about summer because I’d rather it be warm. The other night at the Palace after “Scrooge,” I was talking with Chris Parada, the director of the theater. He’s from Medina, and we had a lengthy conversation on the state of downtown Medina around the Christmas holidays. It brought back a lot of memories that I had of the small canal town. My grandmothers lived in Lyndonville, so Medina was occasionally on the route home, depended whether we took Route 104 or 31. If dad chose 31, we’d try to convince him to make the left turn after the lift bridge so we could see the decorations up and down Main Street rather than bypass it by going 31E. He didn’t always do it, but when he did, we loved it. 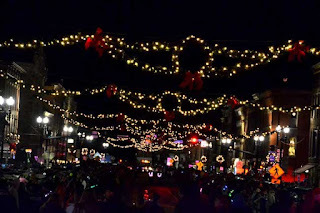 The green, garland-like banners that stretched across Main Street with candles at either side were beautiful to pre-teens still obsessed with Christmas. All the way down the street and a few on Center Street, these decorations welcomed you to Medina and filled you with holiday spirit. As an aside, I wonder how many people know that those decorations originally came from the City of Lockport? We’d drive a bit slower than normal as we traversed from one end of Main Street to the other. That didn’t really bother anyone, as they were very likely doing exactly the same thing. We were taking the time to soak in all the decorations and great spirit that it provided.Beautiful things should always be admired. Combined with a quaint, old fashioned downtown facade, the decorations were straight out of an idyllic Norman Rockwell painting. We used to count the houses with holidays lights on each side of the road for the trip home. My sister would take one side and I would take the other. Whoever had the most won. What we won wasn’t important, generally because it wasn’t for anything other than bragging rights. Many times, I tried to make sure I sat behind the passenger seat. That way, I could say the lit Christmas tree at Fisher-Price was one of my award winning light counts. That tree was always a highlight. We’d start looking for it right about Thanksgiving time. Which brings me to Lockport. First of all, the giant wreath at the bank on the corner of Washburn and East Avenue is one of those traditions I’m glad to see continue. After the bank was taken over by a non-local bank and they so blithely removed our beloved clock, I was concerned they would not put up the wreath. Thankfully, they did. The new wreaths on the light posts from Washburn to Transit look stupendous. I love them. They make downtown look so grand. Even in the daylight, with the red garland winding its way down the poles from the wreaths, it looks great. I’m so glad that the whole street was lined with them. 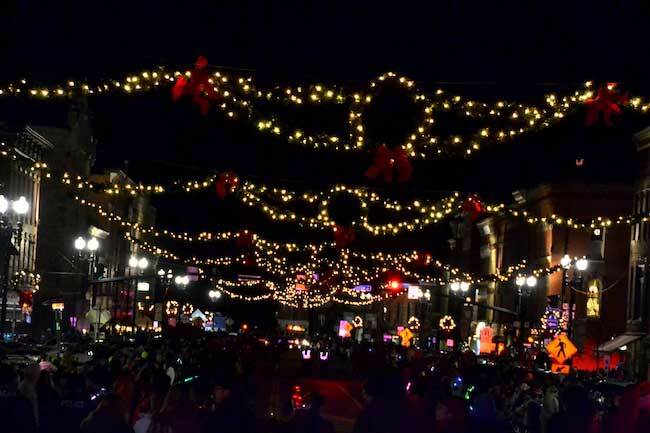 WIth all the houses that are decorated this year (seems like more to me than ever before), Lockport has become quite a festive city. Craig Bacon is not a big fan of Christmas, but he loves all the decorations. He thinks it’s pretty awesome that so many people are into decorating their homes. It makes for great ride around town.